Google Now Showing App Performance in Search Results!!! Who doesn’t love more data?!?!? Google is now adding some extra functionality in the Search Console (formerly Webmaster Tools) for a bit more transparency on how your app fares in the SERPs. 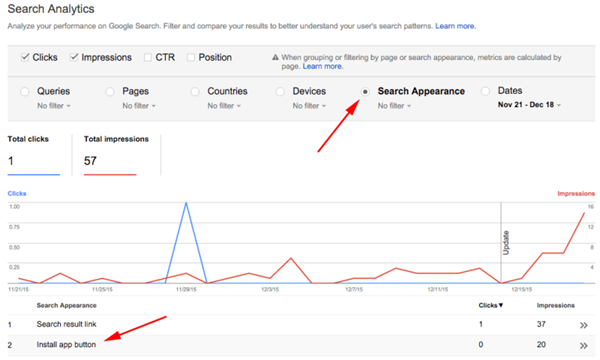 Now, once your app is verified in the Search Console, you’ll be able to review app metrics via a “Search Appearance” report. This will allow you to see impressions, app button clicks as well as segment the data by keyword, countries and devices. So, how do you verify your app you say? 1. You must have Google Play management rights on the app. 2. You must be logged into the Google Search Console account with the same credentials. 3. Add a new property for the app. If you do not have this level of admin, the only other way to gain access is to have the owner of the app property give you access to the verified Search Console account.